In between working full time and summer school Derek and I were able to squeeze in a fun vacation. We went on our first cruise and it was amazing. 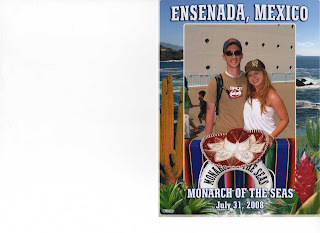 We left from L.A. and went to San Diego, Catalina Island, and then finished it off in Encenada Mexico. The food was incredible! Surprisingly we both didn't gain any weight, yea I know what some of you are thinking, like Derek could gain any weight. 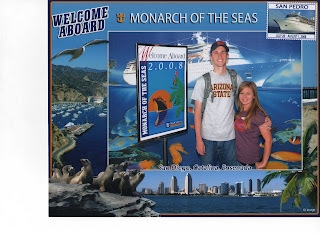 We would definetly recommend a cruise to any one who wants to get away!!! Monarch of the Seas...Getting on the Boat! Hurray for blogs!!! So fun to see your cruise pics!! YEAH! I am so glad you started one! 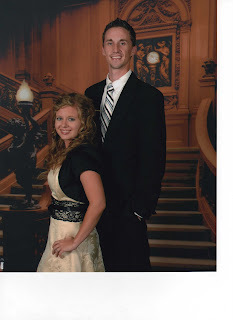 I love your cruise pictures! What fun! I cannot believe you will graduate in May! You go girl! Your blog is so cute! I love it! I love your pictures - I am jealous, I don't think I can ever get Aaron on a cruise because he thinks that they all sink like Titanic... Anyway - good job, I love it! Amen to Aaron guy in the comment above mine. You'll not see me on a cruise. Worse than drowning I'd probably get eaten by a shark.